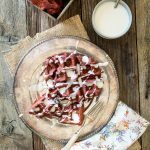 While sweet waffles are totally my jam, I often like to mix things up with some savory waffles. 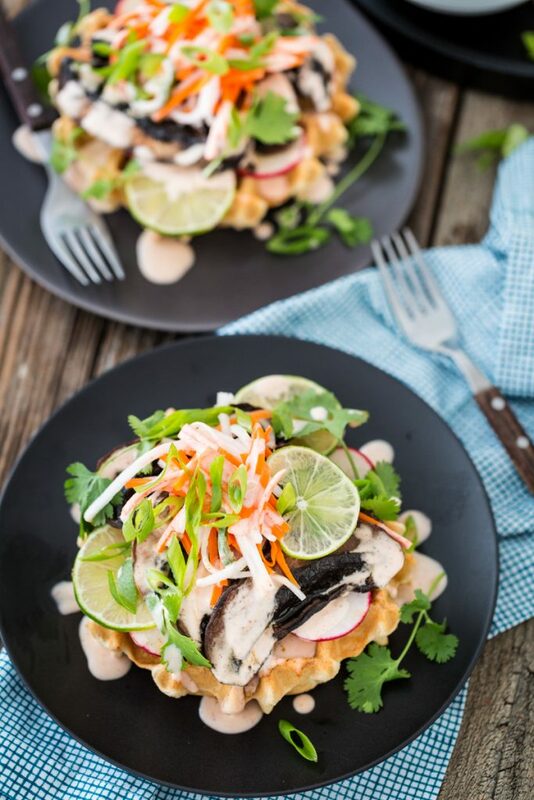 Most recently, I did a savory spin on the Miso-Tahini Waffles, making these incredible Bánh Mì Waffles for dinner. If you’ve followed this blog for awhile, you know that I love my Bánh Mì. 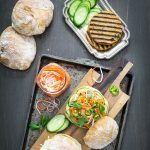 I’ve made Bánh Mì Burgers and there’s also my favorite bowl of all time, the Bánh Mì Bowl. I even have a more traditional Bánh Mì sandwich in my upcoming cookbook. In the past, though, I’ve always resorted to using tofu as my meat replacement. 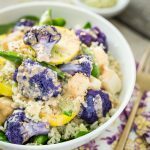 Don’t get me wrong, I still love my tofu, but I was looking for something that could come together a little more simply. You know, something that didn’t require pressing or a watchful eye as it cooks in the skillet. This time, I chose to use portobello mushrooms. 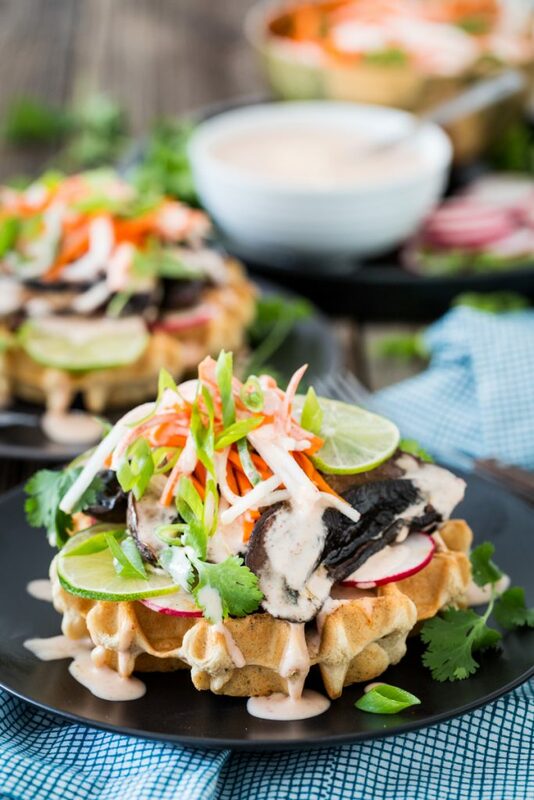 Cut into thick slices and roasted in a simple sauce of tamari, rice vinegar, maple syrup, and Chinese 5-spice, the portobellos make a quick and easy, toothsome and succulent option for your Bánh Mì waffles. Plus, they cook so quickly, they’ll probably be ready before your waffles! 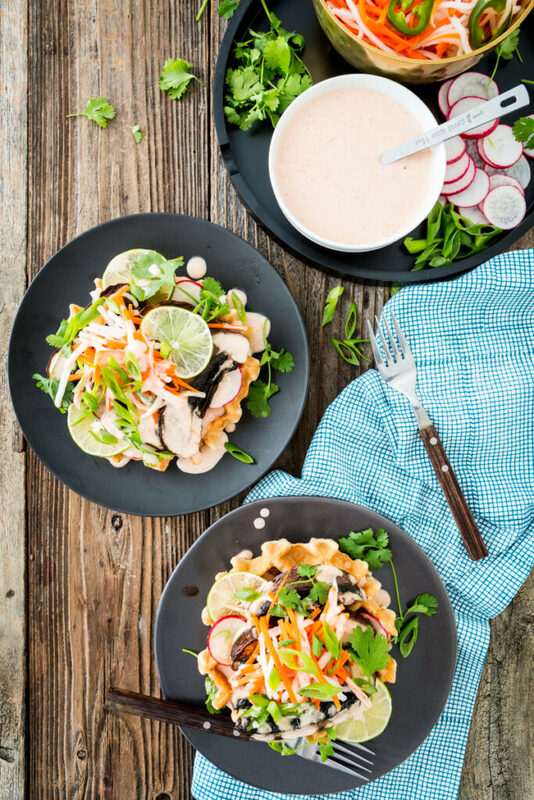 Along with the tasty portobello cutlets, we have sliced radishes and/or cucumber, fresh cilantro, Pickled Carrot & Daikon, and a creamy, sriracha-laced aioli sauce to top our savory waffles. Every bite is absolutely packed with flavor and textures. 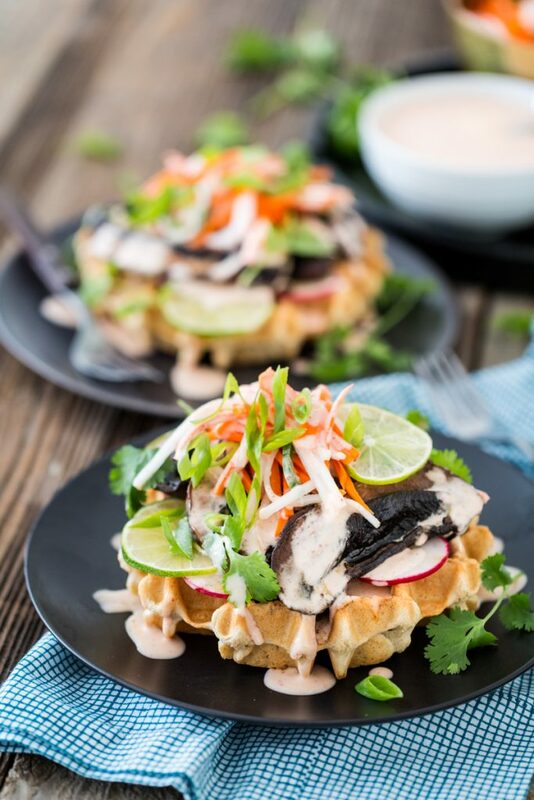 And the miso-tahini waffles are just crisp enough to not fold under the weight of all these toppings, but soft and doughy enough to soak up the juices from the portobello mushrooms and the sauce. Recently I’ve gone back to work so my dinner-making time has been severely reduced. By the time I get home and walk the dogs, I’m already begin to fade. So, in an effort to not order dinner in every night, I’ve been prepping things in advance so dinner can come together quickly. This meal is especially easy to prep. I made the pickled carrot and daikon salad, the sriracha aioli, and the waffles over the weekend so all I needed to do was cook the mushrooms (which is stupid-simple), slice up some radishes and cucumber, and reheat my waffles (you can heat them up in the microwave or wrap them in aluminum foil and place them in the oven for the last 5 minutes of the portobellos cooking time). I even had time to change into my pjs and check the mail. In just 30 minutes, I was able to dig into this masterpiece of a savory waffle. Combine the ingredients for the aioli in a small bowl and whisk until combined. Refrigerate until ready to serve. Combine the tamari, rice vinegar, maple syrup, ginger, and Chinese 5-spice in a cup and whisk until combined. Pour into a square, shallow baking dish. Place the portobello strips on their sides in the dish and then flip each strip over so that both sides have been covered in sauce. Preheat the oven to 400, letting the mushrooms marinate while the oven preheats. Once the oven is heated, place the dish in the oven and bake for 12 minutes. Remove the baking dish, flip each strip over and return the dish to the oven. Bake for 12 more minutes. Remove from the oven. If you are waiting for waffles to cook, you can turn the oven off but leave the dish in the oven with the door cracked so that they'll stay warm while the waffles finish cooking. To serve, drizzle each waffle with a little bit of aioli sauce. 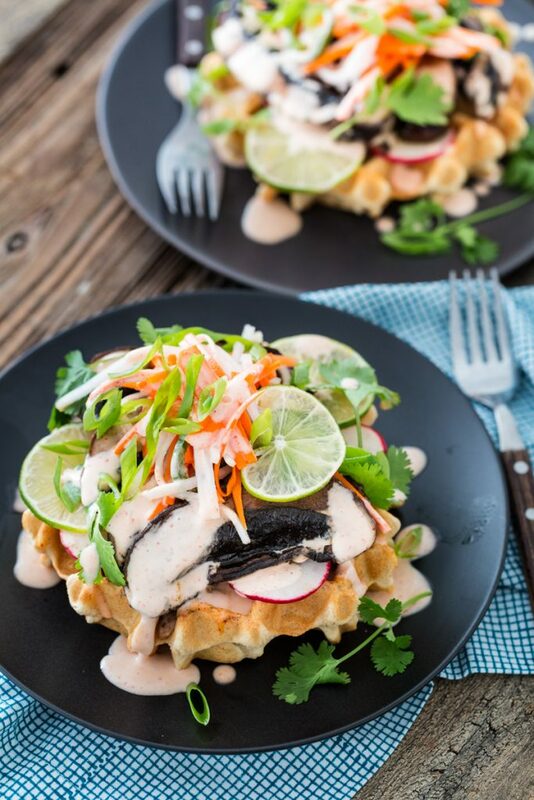 Make a thin layer of radish and/or cucumber slices on top of the waffle. Top each waffle with 4 to 5 strips of portobello. Top with pickled carrot & daikon, cilantro, green onions, and lime wedges/slices. Drizzle with more aioli sauce and serve immediately. Don't have time to make waffles (or have a waffle-maker)? Just cook up some rice and through everything in a bowl. 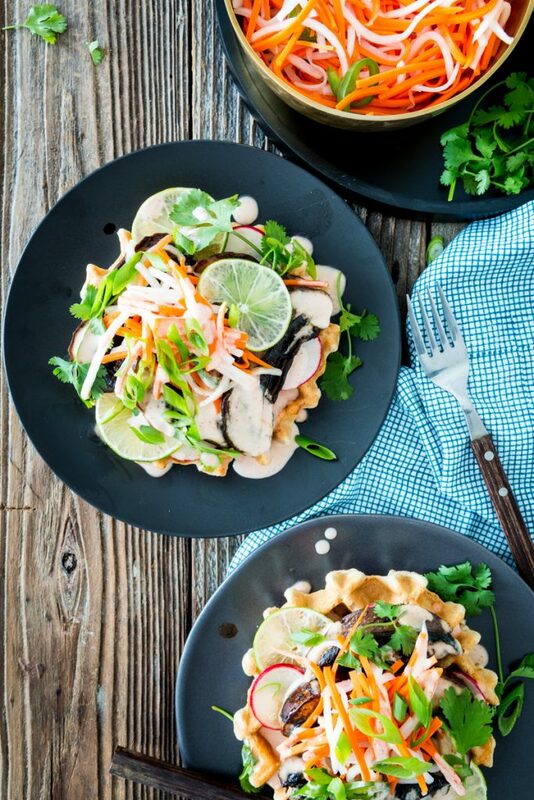 Sweet waffles vs. Savory waffles: Which side are you on? 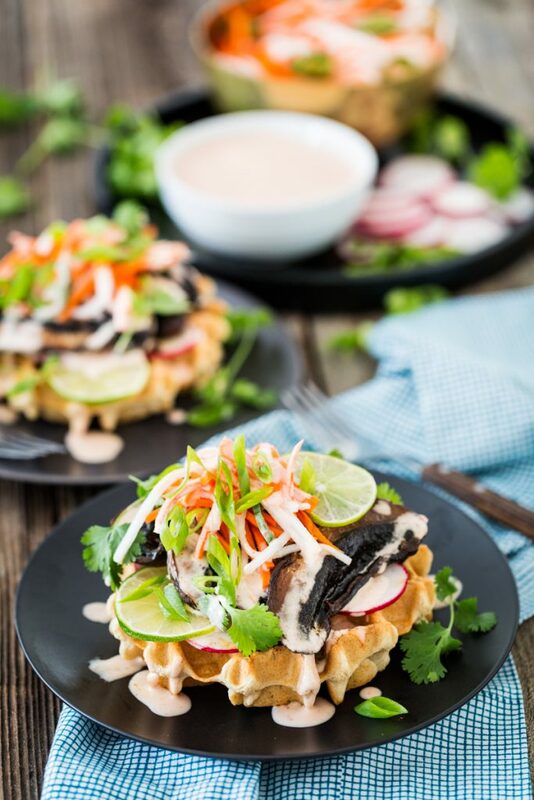 2 Responses to "Portobello Bánh Mì Waffles"
This looks really appetizing! Great recipe!